On the Loop Edit page you will see Speed and Tune controls. Speed – There are a total of 4 Speed controls at your disposal: 1/4 (quarter speed), 1/2 (half speed), x1 (normal speed) and x2 (double speed). Selecting a speed will multiply the speed of the Loop playback by the amount selected. Tune – You can use the slider in the Tune section to pitch a Loop up or down by semitone. 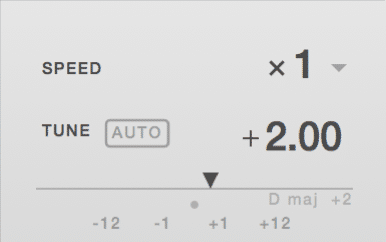 When hovering in the Tune section you can also adjust the tuning of the Loop by clicking on the +/-12 buttons to adjust the tuning by one octave, and +/-1 to adjust the tuning by one semitone. Clicking on the Auto button will automatically set the tune of your Loop to match the session key. For example, if the Kit is in the key of A Maj and you have a Loop in C Maj, selecting Autowill tune the Loop down a minor 3rd to match the Kit’s key.